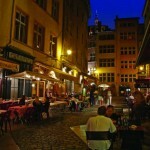 Even the taxi drivers are gourmands in Lyon, the beating heart of French cuisine. “It isn’t the food capital of France,” Bruno insists, swinging the cab around a corner to reveal the Saône River, shimmering beneath the early-evening lamplights of the Vieux Lyon’s waterfront façades. “It is the culinary capital of the world.” Then, from his pocket, he whips out a garnet-red beef kidney, glistening in its plastic casing, and excitedly describes how he’ll be rustling it up for dinner. Bruno bought his rein from Les Halles de Lyon Paul Bocuse, arguably France’s finest food market and whose namesake is the grandfather of modern French food. Paul Bocuse was born at Collonges-au-Mont-d’Or, a village on the northern outskirts of Lyon, in 1926 and it’s where his world-renowned restaurant is located today. At the ripe old age of 89, Bocuse still occasionally frequents Les Halles, which was renamed after him following its 2006 renovation, in recognition of the chef’s enduring contribution to his country’s gastronomy. Not long ago, each morning, Bocuse would visit the market for a coffee and to browse its 58 stalls, but old age has rendered his outings less frequent. Rows of saucisson and andouillette dangle side-by-side, above neon-lit butchers’ stalls, opposite rows of glossy vegetables laid out in wicker baskets and tanks crawling with lobsters sporting inky-black and coral-spotted armour. The vendors know Bocuse well, and speak of him with a misty-eyed affection that mirrors France’s fondness for its culinary ambassador. 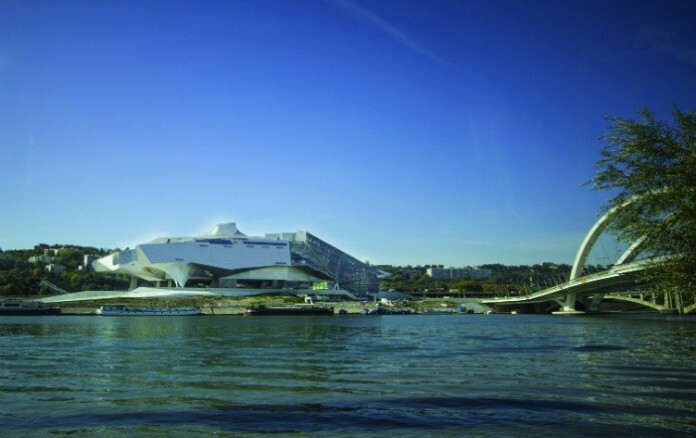 It’s no coincidence that Lyon has a history of nurturing great chefs. The city’s geographical location, at the meeting of two arterial rivers, not only secured its role as a major European trade hub back in Roman times, but also equipped it with a unique terroir. Vineyards surround the city, red fruits and vegetables are cultivated to its west, and countless lakes to the east supply the population with fresh pike and carp. 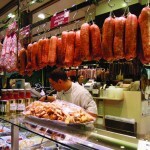 Regional meats are pork-based, namely varieties of sausages and pâtés often prepared en crôute. 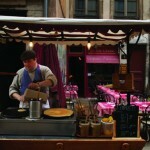 Just as chefs have long been drawn to France’s second city, so today are epicurean travellers keen to get their fill. 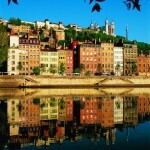 Always a city of cultural and culinary cross-pollination, Lyon’s culinary roots still lie in its traditional bouchon restaurants – rustic working-class taverns which flout any associations between France and fussy haute cuisine. Classic bouchon fare isn’t for the squeamish as it utilises once-cheap offcuts and offal, in meat-heavy, rich dishes, which are traditionally prepared by women. For a cheap and cheerful lunch – and an opportunity to brave a tripe sausage – try Le Petit Glouton on Vieux Lyon’s cobbled Rue Saint-Jean or, on the other side of the Saône, visit Le Café des Fédérations to indulge in some pork-based delicacies. Bocuse fits into Lyon’s rough-and-ready culinary legacy despite being credited with the creation of minimalist nouvelle cuisine. The term was coined by critic Henri Gault following the chef’s menu for the maiden flight of the supersonic Concorde airliner, which favoured light dishes with an emphasis on fresh, elegantly presented ingredients, all elements which would become characteristic of his style. However, Bocuse trained under Mère Brazier – the first woman to receive three Michelin stars – who had learnt her trade from Mère Filloux, a chef who had worked her way up from modest bouchon beginnings to prestigious heights. Because of this, Bocuse was provided with the scope to create innovative fare which was still firmly grounded in the life-blood of Lyon’s food culture. The chef’s favouring of simple, fresh produce is demonstrated in his six brasseries in Lyon. Each specialises in a different type of French cuisine, with Le Nord in the second arrondissement focusing on traditional Lyonnaise fare, serving quenelles sauce nantua, pot-au-feu and saucisson. Near the Place Bellecour, Le Sud crafts foods with a Mediterranean flair, favouring fish and light seasonal vegetables that are doused in olive oil. In the Gare des Brotteaux you’ll find L’Est, which serves fish and oysters amid the to-and-fro of commuters, and L’Ouest on the quai of the Saône River specialises in Japanese and Italian gastronomy. Two more brasseries, the Fond Rose and the Marguerite, equally carry Bocuse’s signature cuisine, which is poised between tradition and innovation. 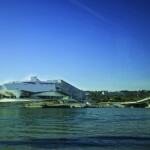 Lyon’s tendency to push the boundaries of innovation while remaining loyal to its heritage is exemplified in its new Musée des Confluences – an anthropology museum at the convergence of the Rhône and Saône River. 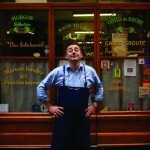 Its thoughtful exhibitions detail the city’s mercurial blend of history and invention which characterises its cuisine. Back in his home village, the fare at Bocuse’s flagship restaurant certainly isn’t cheap, but hungry foodies flock to L’Auberge au Pont de Collonges, a 20-minute drive out of Lyon, from all over the world, in order to splash out on a once-in-a-lifetime meal. 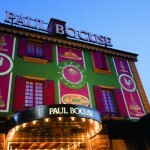 The restaurant is utterly unmissable – a towering farmhouse painted incongruously in garish green and pink, with ‘Paul Bocuse’ spelt in blazing neon across the roof. 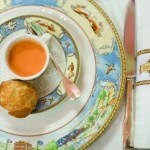 The signature dishes include loup en croûte feuilletée, an entire fish encased in a beautifully rendered pastry case; and soupe aux truffes noires VGE, a truffle and foie gras soup with a puff pastry topping, originally created for a banquet at the Élysée Palace. Elsewhere on the menu is Bresse chicken à la crème, pan-fried foie gras with a passion fruit sauce, frogs’ legs soup and a jaw-dropping patisserie platter.